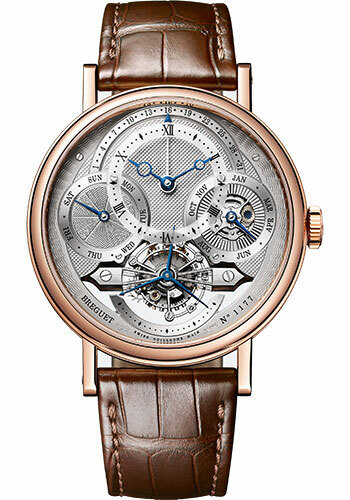 41mm 18K rose gold case, 11.6mm thick, sapphire crystal back, welded end pieces, silvered and multi-patterened engine-turned dial with Roman numerals hours chapter on a sapphire disc, Breguet open-tipped hands in blued steel. Retrograde dates indication at 12 o'clock, days at 9 o'clock, and months and leap years at 3 o'clock, Small seconds on the tourbillon axis, caliber 558QP2 hand-winding movement, approximately 50 hours of power reserve, brown leather strap, triple-blade folding buckle. Water resistant to 30 meters.